Fludes naturally artificial grass, represents a wide range of tufted artificial grass qualities that can hardly be distinguished from real grass. They are produced with high quality yarns, are very durable and require very little maintenance. Your lawn will looks great all season long! Our grass looks so natural most people can hardly distinguish it from real grass. No more mowing, weeding or watering. Saving you time to kick back and enjoy your garden. Spring, summer, autumn, winter: Our grass always looks perfect! Our naturally artificial grass has a porous backing, allowing sufficient drainage during heavy rainfall. The UV-protection prevents discolouration. 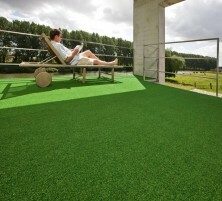 On hard surfaces (terraces, balconies etc) just roll out your artificial grass. On soft surfaces (earth), first level the surface, then install the grass. See our installation instructions here. Soft & comfortable for extra fun at play. No muddy feet or green stains. Our grass is colourfast, robust and looks good for many years. Enjoy your lawn for years. Where can I put artificial grass? Please give us a call if you are thinking about naturally artificial grass on 0800 0388 010. We can chat through your options with you so you can make an informed decision.